Mareike Leimeister is an Offshore Wind Engineer at Fraunhofer IWES with special interest in floating offshore renewable energy systems. She has a Bachelor of Science in “Renewable Energies” from University of Stuttgart and a double Master of Science degree in “Offshore Engineering and Dredging” from Delft University of Technology and in “Technology – Wind Energy” from Norwegian University of Science and Technology. 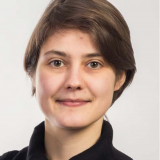 She already wrote her Master’s thesis at Fraunhofer IWES and works there now as a research associate in the group for load calculations and system dynamics. She is the manager of the joint research project TANDEM and focuses on the hydrodynamic research topics. In parallel, she carries out an Engineering Doctorate Program with research focus on reliability-based optimization of floating wind turbine support structures.